Viewers! Don’t loosen your resolve, hold strong from the sad face of Kemchart and remember how evil he was! Don’t let that face weaken you, he’s got to be put through the ringer first. Although I must say, we are starting to see the shift in the direction of this lakorn, gearing for the third act, oh especially the end of this episode. The denial, the wall around Kemchart is slowly (but surely) disintegrating. People are not letting him off the hook this time around. Case in point, Kanlong, she’s inviting Channa and Su to assist her with the engagement planning because she wants to see how jealous and batshit crazy Kemchart would get when he’s around Su. She’s of the opinion that one has to see it to believe it. But can she accept the truth when it slaps her in the face? Can she accept the fact that Kemchart is in love with Su? Kanlong feels assured that she can and will end things. Secondly, Eua is not putting up with Kemchart’s complete disrespect for Su. He gives him a sweet punch in the face and reminds him that he doesn’t know Su well enough to form that opinion. Ouch. But yeah! Then we have his very own trusted right hand man who hires an investigator to dig up his boss’ past! 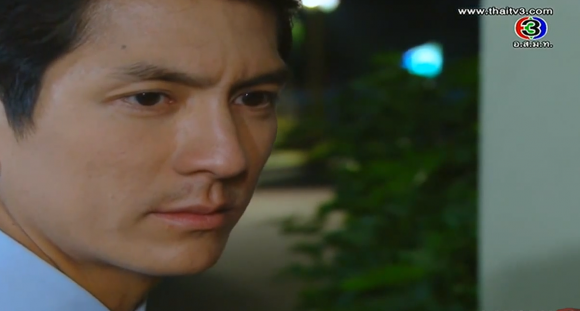 He warns Kemchart that Kanlong could easily do the same, and she can easily find out about him and Su. Be afraid Kemchart, be very afraid. Most importantly, Su’s not going to let him walk all over her anymore. Just because she donated her body to him one night, doesn’t mean he owns her. Realizing that their passionate love that night meant that she has repaid his debt, Kemchart has no other reason to justify why he wants to see her. Is it because he can’t forget about her? Is it because – like Somkit tells him – that she could easily move on but he simply could not? Oh the diabolical man, could it be possible that he’s feeling remorse? We can tell that the tone of this lakorn is switching gears and waiting to close out this melodrama to a hopefully wrung up pr’ek. But seriously, don’t look at his sad eyes! Because maybe that made me smile a little today. And maybe that made me feel a little more hopeful today. Alas don’t forget to head on over to Darkness Lakorns to read the full recap for episode 9! See you back here for episode 10!